20th Festival Gourmet International held in Puerto Vallarta from November 13-23 began with a stunning outdoor food and wine gathering at the Westin Hotel & Spa Resort. The venue was over flowing with talented local and visiting international chefs, as well as enthusiastic 'foodies' who thoroughly appreciated the divine food and wine being presented. The magic of the evening tasting was enhanced with performances by talented local musicians, and the grand award presentation ceremony honoring the chefs. The �three musketeers� who coordinate this amazing event, Chefs' Thierry Blouet, Heinz Reize and Roland Menetrey, were all on hand to greet guests and present awards, including one award presented to annual guest chef Gerard Dupont, President of the Culinary Academy of France. The ten day festival was originally created to enrich the profile of Puerto Vallarta's gastronomic scene locally and internationally, and in the past nineteen years, it has more than exceeded in accomplishing this goal. Celebrity media and jouralists from the Los Angeles attending the event included celebrity chef and restauratuer Bobby Bognar, known for his work as host of the Food Tech show on The History Channel. TasteTV ambassador's included Bobby Bognar, Susan Irby known as the Bikini Chef and myself. We have all been participants as celebrity chefs or judges for the annual TasteTV Awards (www.tastetv.com) in Hollywood since its inception. Bobby Bognar enjoyed meeting Chef Gerard Dupont and Chef Thierry Blouet during the festivities. Participating chefs creating gourmet dishes at local restaurants included Guy Santori, France; Orlando Maria Hugli, Switzerland; Ben Cotrell, US; Chris Bradley, US; Davide Marchetti & Giuseppe Angeloni, Italy; Ryan Steyn, South Aftica; Vicente Torres, Spain; Dominik Enderle, Germany; Cheryl Rosario & Sarbhal Da Silva, India; Pato Persuo & Marcas Gabriel Fulcheri, Argentina; Kristoffer Andersson, Sweden; Pedro Martin, Canary Islands. Mexican Chefs included Jose Fernando Perez, Juan Carlos Chavez, Mario Blanco, Carlos Gaytan, Sebastian Hamdan, David Cetina, M. Miguel Quezada, Giovanni Romero, Jose Ivan Lodera, Jesus Gibaja, Maria Teresa Alanis, Thomas Bermudez, Angel Carbajal, Mico Mejia, and Edgar Nunez. I especially enjoyed meeting the visiting chef from Zurich Switzerland, Orlando Maria Hugli, who worked at world-class hotels in Switzerland and the 18 Gault-Milau/one Michelin Star Restaurant Zirbelstube in Stuttgart. Currently he is completing his BS in Food Technology at the University of Zurich. Hugli was serving original Swiss inspired recipes at Coco Tropical Restaurant & Beach Club during the festival. �We are very happy to have these talented visiting chefs participating in our Puerto Vallarta restaurants during our 20th anniversary festival celebration. Guests have shared with me their pleasure with hotel accommodations and the wonderful festival events included in this years program,� said Chef Thierry Blouet, Gourmet Festival Committee and chef/owner Cafe des Artistes. The 29 restaurants participating included Andrea Gourmet, Arrecifes, Boca Dosstk, Bordeaux, Cafe des Artistes, Coco Tropical, El Quincho, Emiliano, Frida, Green Bistro, Kaiser Maxmilian, La Casona, La Catrina, La Corona, La Leche, La Palapa, La Patrona, Las Gasitas, Las Pampas, Michel's, Nicksan, Porto Bello, Punta Arena, Sanzibar, Sea Breeze, The River Cafe, TRIO, Imanta, and Tuna Blanca. Wine and beverage sponsors included Monte Xanic, VINOS Wagner, Ferrer-LCM, Venos Americas, Vinoteca, Moet & Chandon, Patron Tequila, Minerva, Lavazza Coffee, Rougie and S. Pellegrino Water. Congratulations to Puerto Vallarta and the Puerto Vallarta Tourism & Convention Board, the talented organizers, sponsors and chef participants for yet another fantastic and delicious gourmet experience. For details and updates on the 2014 event please visit: www.festivalgourmet.com. Walking into Dry Creek Kitchen takes you into a vibrant atmosphere that is alive with great smells, inviting lighting, and warm greetings. The bar is sleek and filled with guests enjoying cocktails with friends. The connected dining room is comfortable and chic, with lovely illumination for evening dining. Our table is in the center of everything, where we are introduced to the Dry Creek team who will contribute to our evening of fine dining. It is often the case that restaurants with distant roots do not reflect their own local treasures. This is definitely not the case at Dry Creek Kitchen in Healdsburg, California. Once you see the wine list that is devoted to area produced wines you realize this Sonoma County venue represents a showcase of wine stars in their wine cellar, not unlike the amazing collection of stars on Hollywood Boulevard, yet there is clearly Charlie Palmer branding all over this kitchen! This restaurant is a true treasure and an incredible venue to enjoy the best of Sonoma Valley. Dry Creek Kitchen's wine program, under the direction of Courtney Humiston, reflects the diversity of Sonoma County and includes legendary Pinot Noir and Chardonnay from the Russian River Valley and the Sonoma Coast to the powerful Cabernet Sauvignon from Alexander Valley and the storied Zinfandel�s of Dry Creek. With more than 500 selections, the list includes both sought-after wines from classic producers as well as lesser-known wines from up-and-coming winemakers, unusual varieties and emerging appellations. The list features a one-of-a-kind-collection drawing from the private libraries and cellars of local winemakers, including limited production wines not available anywhere else and they were presented with the 2012 Wine Spectator Award of Excellence. Courtney Humiston works closely with Chef Valette to create perfect pairings that showcase the flavors and ingredients of Sonoma. Their motto is what grows together, goes together! If you would like a copy of the complete list email Courtney at chumiston@charliepalmer.com. 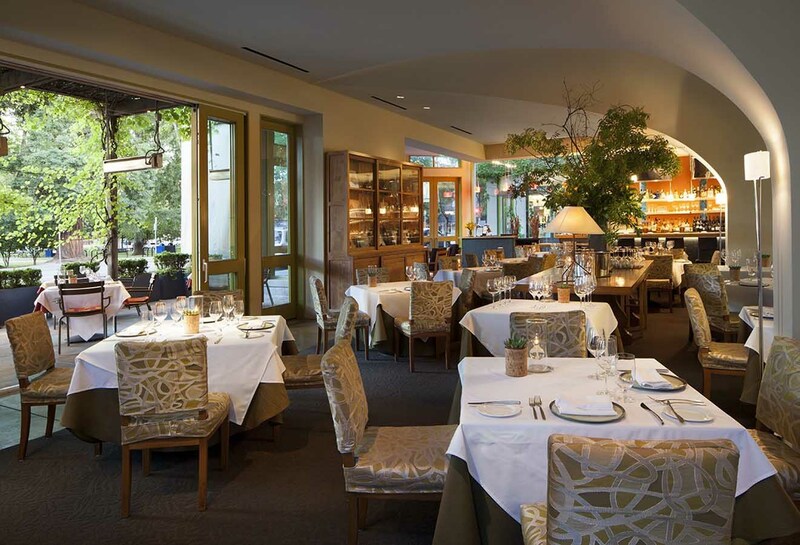 Located in the award-winning Hotel Healdsburg, Dry Creek Kitchen has an ideal location off the historical Spanish-style plaza. The diningroom offers a chic open design that accommodates large or small parties. In winter they have a wood burning fireplace blazing, and in summer they offer wine country dining at its best on the out-door patio. The Dry Creek executive team includes Dustin Valette, Executive Chef, Andrew Di Clementi, Pastry Chef, Drew Munro, General Manager, Courtney Humiston, Wine Director and Lindsay Rudell, Events Manager. Dustin Valette began his culinary career at Chateau Sourverain, a Francis Ford Coppola Estate in Geyserville, California where he apprenticed under Executive Chef Martin Courtman. Now, more than 10 years later, Valette finds himself back in Northern California�s wine country as chef de cuisine at Charlie Palmer�s Dry Creek Kitchen. Valette honed his craft in some of the most celebrated restaurants on the West Coast, including the Michelin-starred Aqua in San Francisco and Napa Valley�s Bouchon. He was also at Hokus at the Mandarin Oriental Hotel Honolulu, a five-star, five-diamond property; the exclusive North Ranch Country Club in Westlake Village, California; and most recently, VOX Restaurant & Wine Lounge in Henderson, Nevada. At Dry Creek Kitchen, Valette draws on the strong relationships he has cultivated with local farmers and purveyors to provide the restaurant with the area�s freshest and most exceptional ingredients. Originally from Sonoma County, Valette is a graduate of the Culinary Institute of America in Hyde Park, New York. He currently resides in Healdsburg. 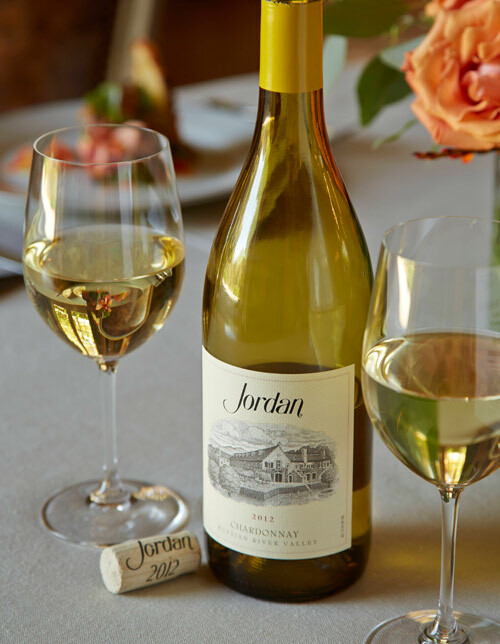 For our recent dinner at the kitchen the vegetable items were harvested from the Jordan Vineyard, and crafted by Chef Valette into a one-of-a-kind menu. The first course of our elegant Dry Creek Kitchen dinner was Hawaiian Ahi Crudo with roasted strawberries, toasted cashews, pickled green Fuyu persimmon and Yuzu strawberry gastrique, paired with N J Brut Rose/Russian River Valley. The second course was Scallop En Croute, an amazing recipe and presentation of baby leeks, young fennel, caviar Pernod Beurre Blanc, paired beautifully with 2012 Jordan Chardonnay/Russian River Valley. 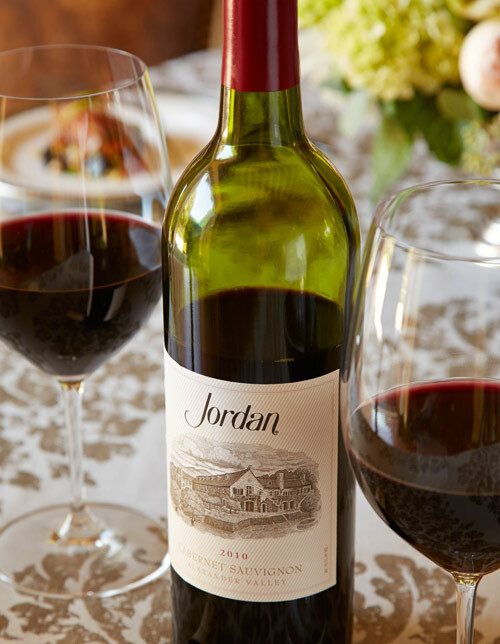 The main course was a magnificent Char Grilled New York with mushroom fondue, roasted baby beets, blue cheese 'tater tot' and sauce au poivre, paired with 2010 Jordon Cabernet Sauvignon/Alexander Valley. The Carrot Gateu cream cheese cr�me with autumn spiced carrots and mascarpone ice cream was a perfect ending to a truly outstanding dinner prepared by charming Chef Dustin Valette, who personally attended to our table, and his very talented staff. Dry Creek Kitchen is open for lunch Friday � Sunday from 12:00 to 2:30 p.m. Dinner hours are Sunday � Thursday 5:30 to 9:30 p.m. and Friday � Saturday 5:30 pm to 10:00 p.m. For reservations call (707) 431-0330. Visit: www.charliepalmer.com for menu and event information. Preheat oven to 325 F. Sprinkle 1/2 teaspoon kosher salt and 1/4 teaspoon black pepper inside turkey cavity. Place onion, garlic, herb sprigs, and bay leaves insides cavity. Place turkey breast-side up on rack in large roasting pan. brush with half of butter; sprinkle with 1/4 teaspoon pepper and remaining salt. Truss, if desired. Tent turkey with foil, roast 2 hours, 30 minutes. Remove foil, brush with remaining butter. 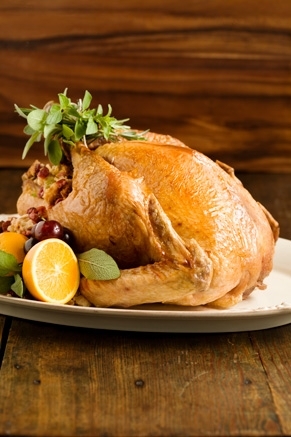 Increase oven temperature to 425 F. Roast turkey until meat thermometer inserted into thickest part of thigh away from bone registers 180 F about 45 minutes, tenting with foil during last 15 minutes of cooking time, if browning too quickly. Let stand 15 minutes before carving. Meanwhile, skim and discard fat from pan juices. Place roasting pan with 1 1/2 cups juices over medium heat. Add broth, chopped thyme, and remaining pepper, stirring up browned bits from bottom of the pan. Simmer 3 minutes. Stir together cornstarch and 1/3 cup water. Strain gravy into small pot over low heat, gradually whisk in cornstarch mixture. Simmer stirring, until thickened, 2 minutes. These are small sweet pancakes served for breakfast or afternoon tea. My grandmother placed whole apple slices on the batter while it was sizzling in the pan. 2 eggs, 12 fl. oz milk, 2 tablespoons superfine sugar, 11 oz self rising flour, 4 small eating apples, 2 oz unsalted butter for frying, and powdered sugar for decoration. Whisk the eggs, milk, and sugar together, then fold in the flour. (These pancakes are like pikelets and need to be thick and fluffy so it is best not to use an electric mixer). Add a pinch of salt, cover and put aside for 30 minutes. Peel the apples, cut into halves, de-core and slice thinly. Melt a knob of butter in a hot frying pan and add a dollop of the batter mix to form a pancake. Lay one or two slices of apple on top of the batter then fry for a couple of minutes. Turn over and cook the other side. Sprinkle with icing (powdered) sugar and serve hot. The Japanese star chef Nobuyuki Matsuhisa � better known as Nobu � is changing his restaurant concept after almost ten years in the legendary Badrutt's Palace Hotel, from Nobu@Badrutt�s Palace to his premium brand Matsuhisa. One of only six Matsuhisa Restaurants worldwide, the Grand Opening will take place on December 20, 2014. The celebrity chef will be present in the kitchen for the first few days, answering guests� questions and signing his book �Nobu: The Cookbook� on request. In his Matshuhisa restaurants Nobu underlines the creation of special gourmet dishes prepared with the highest quality ingredients and in an intimate atmosphere. Regular guests such as Madonna, David and Victoria Beckham and Kate Winslet have been dining for years on unforgettable Sushi and Sashimi plus a wide selection of vegetarian, Japanese and South American dishes at the original Matsuhisa-Original in Beverly Hills. Matsuhisa@Badrutt�s Palace opens in December 2014 just in time for the festive season, skilfully fusing the art of Japanese and Peruvian cuisine. Black cod, Yellow Tail Jalapeno and Rock Shrimp Tempura are among the specialities. �I always put something special in my food � my heart, or 'kokoro' as we say in Japanese,� Nobuyuki Matsuhisa comments on his success. The new hotspot is located in a unique location: the first European tennis hall, where the International Tennis Federation�s world championships were played in 1922 on its wooden parquet floors. London�s Martin Brudnizki Design Studio was adamant that the interior design should not seem out of place in the hotel - therefore classic elements mix with modern to lend it a stylish twist. For example, the original riveted steel girders of the tennis hall remain crossing the glass dome. Through this glass dome, guests can view the St. Moritz landmark, the Badrutt�s Palace Hotel tower or La Coupole, which is the restaurant�s focal point and its namesake. 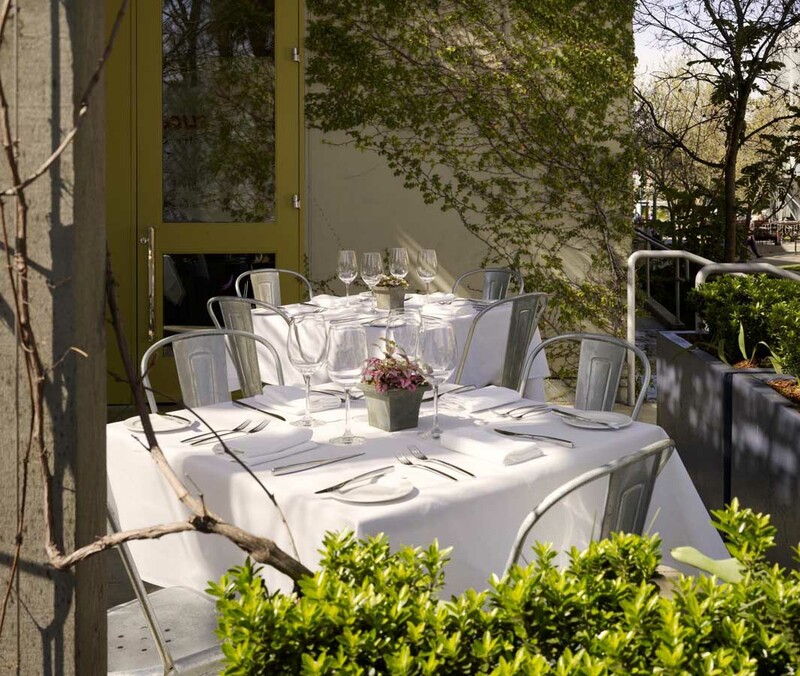 The au courant venue is also perfectly suited for private occasions and events. �My personal favourite will be our �Magic Table�,� says Hotel Director Hans Wiedemann, letting us into a secret. The private dining room for about 10 people goes hand in hand with the aspect of privacy, a cornerstone of Matsuhisa�s philosophy. While guests take part in a wine tasting in the private lounge, separated by barely visible doors, the table is laid in the neighbouring room. This means that it is even possible to change the table decoration between courses � as if by magic. At the age of 24 Nobuyuki Matsuhisa moved to Lima, Peru, where he opened his first restaurant. This period had a lasting influence on Nobu. From that moment on he began incorporating Peruvian influences into his cooking and laid the foundations for his individual specialities. After furthering his career with stints in Argentina, Japan and Alaska he moved to Los Angeles where after nine years Nobuyuki opened the first Matsuhisa in Beverly Hills in 1987. 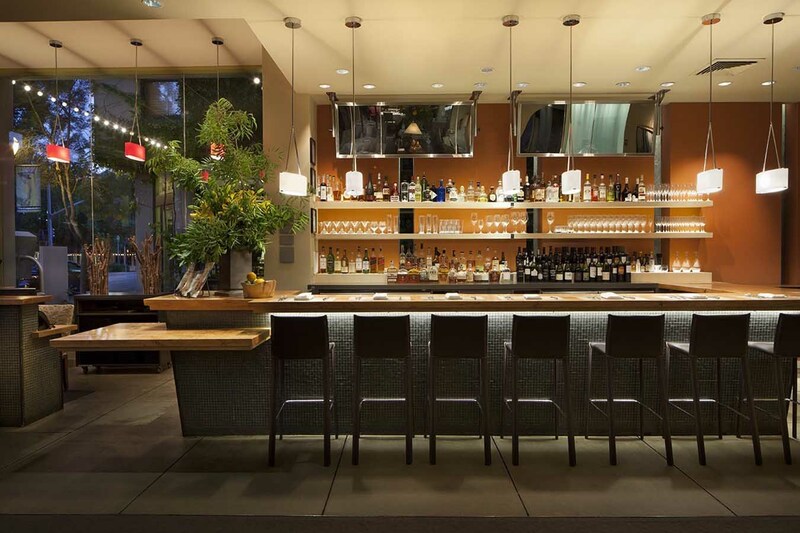 There are five Matsuhisa restaurants worldwide in Beverly Hills, Aspen, Mykonos, Athens and Vail. Characteristic of the pared down Matsuhisa philosophy there is a highly controlled expansion in only a select few destinations. Open from December 19, 2014 to March 14, 2015 (only in winter, daily from 7:30 pm to 11:30 pm). In summer the location can be booked for events (price on request). For more information and reservations contact fb@badruttspalace.com or call +41 (0)81 837 2661. For further information and reservations call +41 (0) 81 837 1000 or email reservations@badruttspalace.com. Established in 1814, Colman's Mustard of Norwich has been recognized widely as the iconic English mustard in the U.K. Using a unique and zesty blend of brown mustard seeds (Brassica Juncea) and white mustard seeds (Sinapis Alba), Jeremiah Colman created a mustard with a flavorful heat sensation that has become an essential condiment and paramount ingredient for favorite recipes, even to the highest royal order. In 1866 Queen Victoria bestowed the ultimate seal of approval - the Royal Warrant - galvanizing Colman's Mustard as the crown jewel of mustards and securing its place in the most discerning kitchens around the world. Sold as dry powder mustard and prepared liquid mustard, Colman's Mustard provides a pure, fiery and complex condiment for all recipes and dishes. Visit www.colmansusa.com for more information.